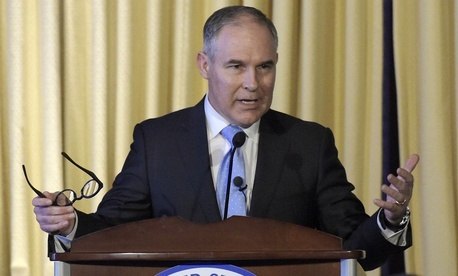 Friday’s report that Environmental Protection Agency Administrator Scott Pruitt is “considering” replacing academic scientists on an advisory review board with industry representatives prompted anguish and criticism from employees and outside science groups. As reported by The New York Times, five members of the Board of Scientific Counselors were told they would not be given their expected reappointments, followed by a statement from EPA spokesman J. P. Freire saying that Pruitt “believes we should have people on this board who understand the impact of regulations on the regulated community,” as part of President Trump’s effort to roll back many EPA regulations. In a statement to Government Executive, Freire said, “Advisory panels like BOSC play a critical role reviewing the agency’s work. EPA received hundreds of nominations to serve on the board, and we want to ensure fair consideration of all the nominees – including those nominated who may have previously served on the panel – and carry out a competitive nomination process." One lawmaker who has favored changes in the science advisory board is House Science, Space and Technology Chairman Rep. Lamar Smith, R-Texas., whose panel approved legislation (H.R. 1431) to “restock” the board. Sponsored by Rep. Frank Lucas, R-Okla., it cleared the House in March and sits at the Senate Environment and Public Works Committee. Smith argued the board was populated in recent years with “experts who have become nothing more than rubber stamps who approve all of the EPA’s regulations” and who have a conflict of interest in receiving federal research grants.